Marvel Super-Heroes Secret Wars # 8 CGC 9.6 White Pages. UnRestored. Marvel Super-Heroes Secret Wars # 8 CGC 9.6 White pages. Blue Label CGC. Case is unblemished. Or, maybe it should have just been left in the wild to be taken down by a predator. Hopefully the price will be right for you to take a chance. Grades are a best approximation. I do my best to give the comic a fair grade. You are buying one VF/NM copy of Amazing Spider-Man 252 FACSIMILE EDITION - this issue reprints the 1st cover appearance of Spider-Man in the black suit. New, unread, bagged and boarded for your pleasure. CGC 9.8 Spider-Man 1 (Silver edition) - Todd McFarlane - White Pages/New Cases! CGC 9.8 Spider-Man 1 (Silver edition) - Todd McFarlane - White Pages/New Case!. Shipped with USPS Priority Mail. Marvel Team-Up #141 FN range, see scan. First appearance of black suit Spider-Man, ties with ASM 252. The Amazing Spider-man LOT 302-306 1988 Todd McFarlane/. Very Fine/Near Mint. Comics from the Todd McFarlane's Spider-Man series. Included are issues #1-#4. Features the first, green variant collector's comic. These comics are in excellent condition. For sale is a copy of Amazing Spider-Man 300, which features the first appearance of Venom. This book has been hot for a while, and doesn't seem to be cooling down any time soon. Please see photos for condition. If you'd like more pictures, feel free to send me a message. The book will be shipped in a toploader. Thanks for looking! The actual comic for sale is the one in the photographs. I do take care of my comics and place my key books in hard plastic sleeves with archival micro-paper inside the cover and last page once they are in my possession. Key 1st venom. Amazing Spider-Man #300. Higher grade. This is marvel team up 141. This comic is in very fine condition. Grades: Solid run in the Fine range with many newsstand variants. Peter Parker The Spectacular Spider-Man #101, John Byrne Classic Cover, NM High Grade, Marvel Comics. Up for sale is Peter Parker The Spectacular Spider-Man #101. In my opinion this book is in NM or better condition, but plenty of pics are provided so you can judge condition for yourself. Amazing Spider-Man 306, CGC 9.8, McFarlane, Action Comics 1 Swipe! Any lines in the photos are reflections, the case is clean and undamaged. It will be packed securely and shipped priority mail in a sturdy box next day after payment is received. I will combine shipping - message me to get combined shipping and I will send you an invoice after you have purchased or won all items in auctions. USA shipping only. ******** IMPORTANT! ******** Due to the number of delinquent bidders on Ebay, I have the following rules FOR AUCTION ITEMS: Payment is due WITHIN 24 HOURS or the order will be CANCELLED and offer will be made to next highest bidder, NO EXCEPTIONS. I expect prompt payment, and in return I always provide next-day shipping, and am available to respond promptly to any inquiries. 4.5 out of 5 stars - Amazing Spider-Man 306, CGC 9.8, McFarlane, Action Comics 1 Swipe! 6 product ratings6 product ratings - Amazing Spider-Man 306, CGC 9.8, McFarlane, Action Comics 1 Swipe! Published by Marvel Comics in 1991. Story, art & "CLASSIC" cover by Todd McFarlane. (check out pic. /excuse glare). Morbius appearance! Spider-Man #1 cover homage! In my estimation the book ranges in "NICE" (6.5) FINE to (7.0) FINE/VERY FINE condition. Amazing Spider-Man #316 Todd McFarlane First Venom Cover Appearance! The Amazing Spider-man #300 Beautiful VF-/VF Condition!! That's a promise! Invoices are sent our daily for your convenience. Amazing Spider-Man # 299 1988 Venom Cameo Todd McFarlane Near Mint. Shipped with USPS First Class Package. Beautiful NM HIGH GRADE COPY. BAGGED AND BOARDED. 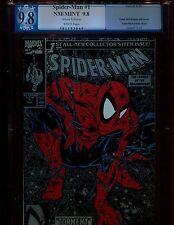 CGC 9.8 copy of ASM 361. The Amazing Spider-man #317 vs Venom!! McFarlane art! VF-NM Condition!! SPIDERMAN #1 (Marvel Comics, 8/1990)-Gold Edition (2nd print) variant with Todd McFarlane's most iconic Spiderman cover, ever! CGC 9.4 (NEAR MINT). I appreciate everyone's understanding! I’m not a collector or expert but it is in near perfect condition! If you have any specific questions or pictures feel free to let me know! Thanks for looking! This is part of the Hilltop Pedigree Collection. CGC books are 9.99 for the 1st and 5 each after that in the USA, 17 bucks and 8.50 combined for Canada and 27 bucks and 13.50 combined for international. Acts 26:18. Amazing Spider-Man 328, CGC 9.8, McFarlane Grey Hulk, NEW CASE! 5 out of 5 stars - Amazing Spider-Man 328, CGC 9.8, McFarlane Grey Hulk, NEW CASE! 2 product ratings2 product ratings - Amazing Spider-Man 328, CGC 9.8, McFarlane Grey Hulk, NEW CASE! The Amazing Spider-man #298 1st McFarlane Art on Title!! Key Issue! VF-NM!!! Invoices are sent our daily for your convenience. That's a promise! WE WILL NOT HOLD ORDERS ONCE PAID NO EXCEPTIONS! Spider-Man #1 Silver CGC 9.8. White pages. No reserve. The Amazing Spider-man #299 McFarlane Art!! Beautiful VF-NM Condition!! CGC books are 9.99 for the 1st and 5 each after that in the USA, 17 bucks and 8.50 combined for Canada and 27 bucks and 13.50 combined for international. In my opinion, this book looks beautiful high grade. The interior has perfect white pages! The Amazing Spider-man #301 "The Sable Gauntlet!" Beautiful VF-NM Condition!! 1985 MARVEL WEB OF SPIDER-MAN #1 1ST APPEARANCE VULTURIONS NM Comic. Shipped with USPS Media Mail Package. A mid to higher-grade copy of Amazing Spider-Man 239, featuring the second appearance of Hobgoblin. THE AMAZING SPIDER-MAN #252. inspired the art for 252. CGC GRADED 9.6NEAR MINT PLUS WHITE PAGES. CGC 9.4NEAR MINT MINUS WHITE PAGES. 1984 FIRST PRINT MARVEL COMICS KEY ISSUE. SIGNED by TODD. Marvel 1990. SILVER DIRECT SALE. Amazing Spider-Man 301-330 Complete Comic Run McFarlane 316 classic Venom. Up for auction I have 30 Marvel Amazing Spider-Man comic books. The comics issues are from 301-330 the complete consecutive run. All of the comics come bagged and boarded in around VF condition except 317 which has small tear on the top of the cover. Please see the photos for exact condition of the items. These are great comics for any collection. Items sold as is with no returns please. Need more pictures or have a question just send me a message and I will get back to you. Please make payment within 3 days of winning the auction. Thank you and good luck! The Amazing Spider-man #282 Marvel Frame Cover! Beautiful VF-NM Condition!! That's a promise! Invoices are sent our daily for your convenience. WE WILL NOT HOLD ORDERS ONCE PAID NO EXCEPTIONS! Amazing Spider-Man 347, CGC 9.6, Classic Venom Cover, Erik Larsen, New Case! 4.5 out of 5 stars - Amazing Spider-Man 347, CGC 9.6, Classic Venom Cover, Erik Larsen, New Case! 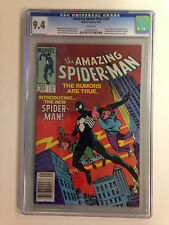 3 product ratings3 product ratings - Amazing Spider-Man 347, CGC 9.6, Classic Venom Cover, Erik Larsen, New Case! Published by Marvel Comics in 1990. Written, illustrated and "CLASSIC" cover by Todd McFarlane. (check out pics. /excuse glare). Lizard appearance! Direct sale only (unbagged). In my estimation the book ranges in "NICE" (7.0) FINE/VERY FINE to (7.5) VERY FINE- condition. Spider-man #1(of 5) Torment Silver CGC 9.8 + BONUS #2- #5 McFarlane at his BEST!